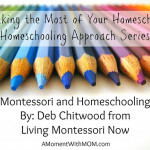 I just want to share a few ideas that you moms (and dads) might find helpful (or reassuring) if you’re intimidated by the thought of Montessori homeschooling, or if it’s all just become too much lately. If you’re happy with what you’re doing, that’s awesome! Continue on! If you are feeling overwhelmed, it’s fine to step back and see what you might want to do differently, at least for awhile. If you’re overwhelmed, don’t worry about changing materials as often. As a Montessori teacher, I didn’t use unit studies. 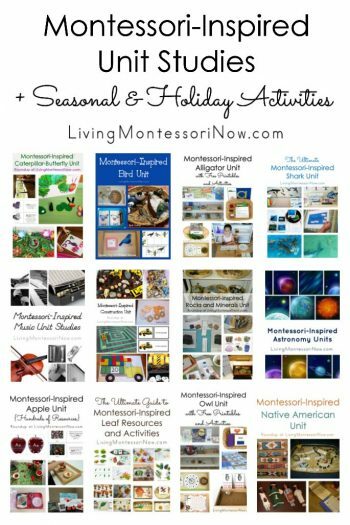 I had the basic Montessori materials on the shelves and rotated art and cultural materials periodically (along with adding a few seasonal materials). Typically, two weeks before a major holiday, I put out some holiday-themed trays. As a Montessori homeschooler, I did the same thing. We started using unit studies when my son was in first grade, so my daughter (the youngest) had a few themed activities, although not very many. I think unit studies are awesome, but they can feel overwhelming if you create hands-on activities for everything. If you’re overwhelmed, don’t worry about changing your theme as often, or simply create fewer numbers of hands-on materials. You can also have your children help you choose a theme that’s especially interesting to them. They might be able to help you prepare some of the activities. We did a lot of reading together during our unit studies. Getting books from the library is one of the simpler parts of homeschooling, and it’s fine to emphasize that if your children enjoy books. Of course, you always need to observe your child’s needs, interests, and natural learning style. But you don’t need to be the “perfect” Montessori homeschooler for your child to get many of the benefits possible from a Montessori homeschool education. When you think about it, how many materials did Maria Montessori rotate in her original Children’s Houses? And look at all the amazing results she saw! If you’re overwhelmed about holidays throughout the year, don’t feel guilty about doing less. I have 10 tips for avoiding holiday burnout that have helped me a lot. You really can cut back. Your family will still love you … and you can still have a special Christmas. You might even be able to use Christmas activities as part of your homeschooling even. 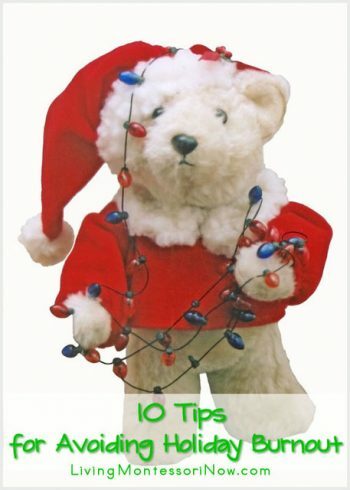 If you check out my post at BitsofPositivity.com with resources for character-education unit studies, you’ll see that you can use holidays like Christmas, Valentine’s Day, and Easter in some unit studies. You don’t need to live in a complete mess or overwork yourself keeping a perfectly clean house. 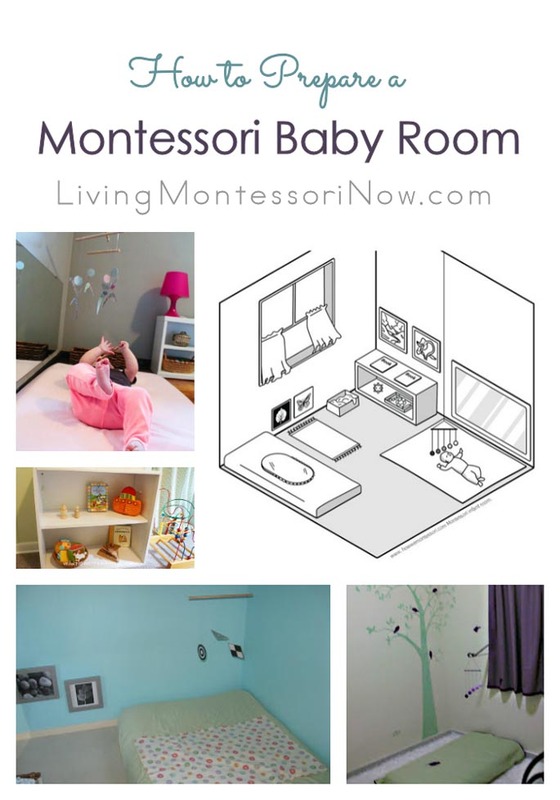 Luckily, Montessori education is designed to help you keep your house livable. If your kids don’t already help you, be sure to emphasize practical life activities for care of the environment along with other practical life activities. 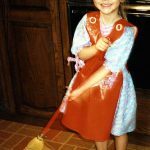 Not only will your kids be able to help you with housework, but they’ll develop better concentration, order, and other positive skills. 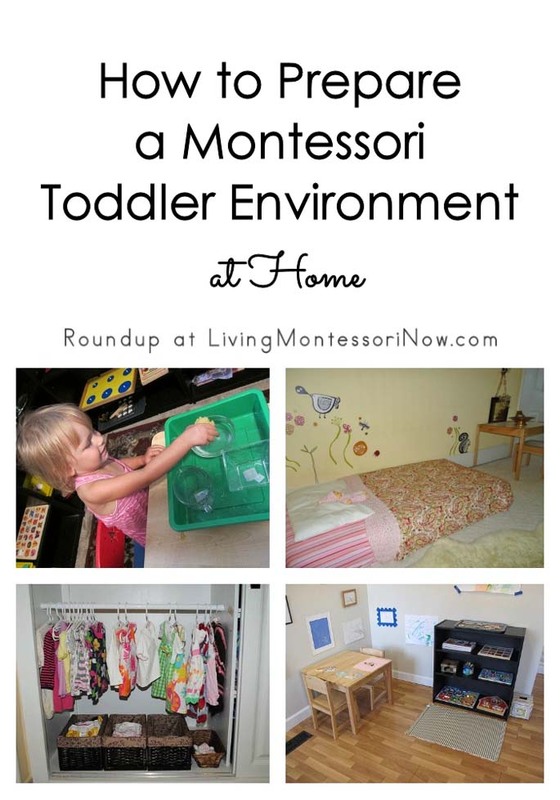 My Montessori-raised kids are much better organizers than I am and are able to take better care of a house than I can. It was easier to keep a clean house with them than without them! It’s nice to know that practical life activities really do have many purposes, which you’ll appreciate the more you devote time to practical life activities even if you put off some academic work in the meantime. 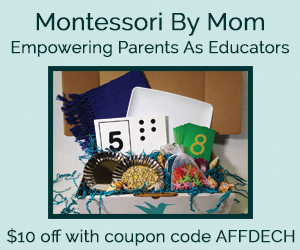 You don’t need to duplicate a Montessori school. 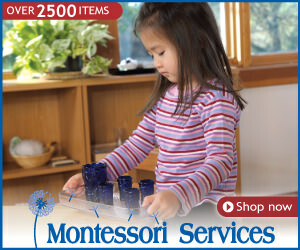 You really don’t need every material a Montessori school has. 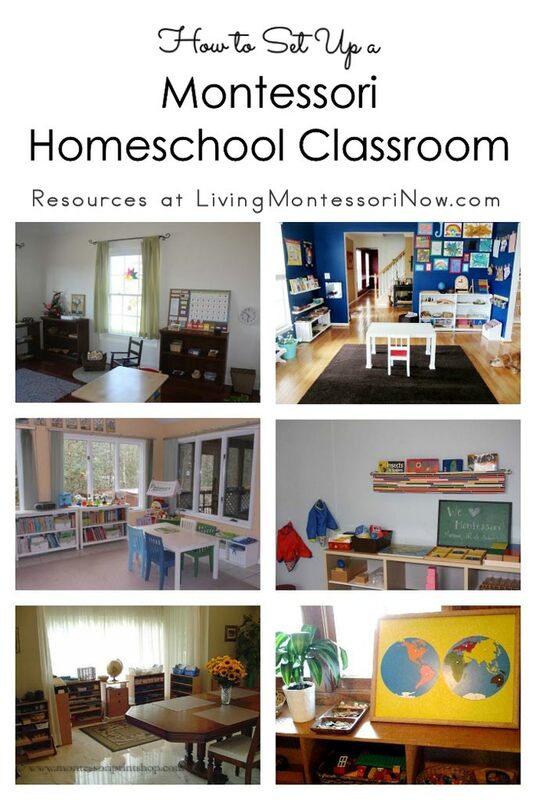 John Bowman’s Montessori at Home eBook has lots of ideas for inexpensive materials or simple alternatives. 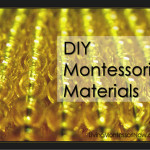 I have lots of roundup posts on DIY Montessori materials with many ideas that are simple to prepare. If you feel overwhelmed at the thought of making materials, see if your husband or someone else can help you prepare materials. Maybe you even have older children who could help make materials for younger children. 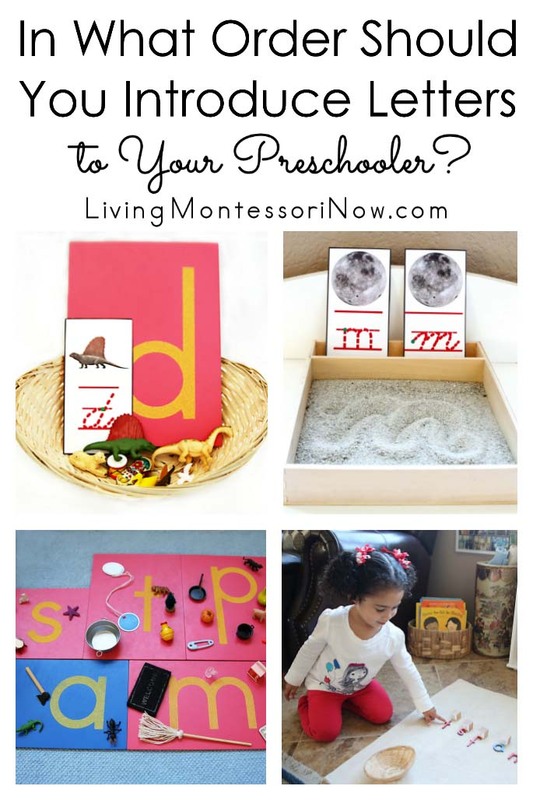 Preparing materials together can be a fun experience, and many of the preschool Montessori materials are helpful for older children as well. 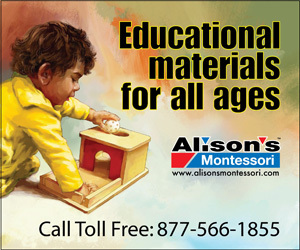 Also, check out the online sites for “Where to Buy Montessori Materials.” In the comments on that post, you’ll find lots of recommendations from parents and teachers of companies that offer relatively inexpensive yet good-quality materials. You’ll find it much easier to just buy some materials. And certain materials I would buy because the wooden Montessori materials are beautiful and difficult to duplicate (such as pink tower, brown stair, and red rods) … unless, of course, you are or have access to a skilled craftsman who would enjoy making them. You don’t need to have perfect laminate edges on everything (or anything). Yes, I had laminate edges on everything as a Montessori teacher. 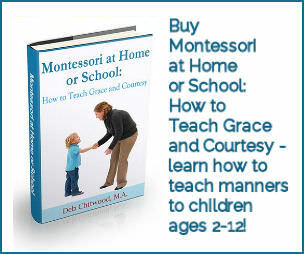 It’s typically not essential as a Montessori homeschooler. 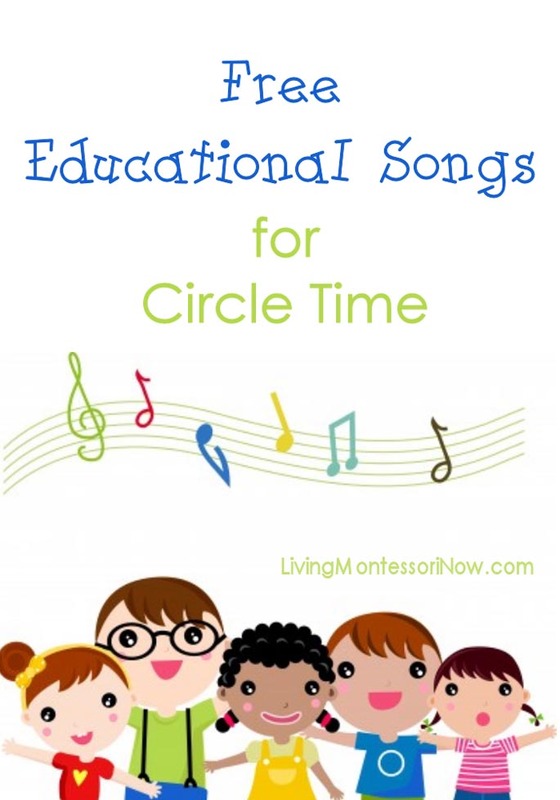 You can see what I would use when laminating for homeschool purposes in this post: “Montessori-Inspired Music Appreciation: Peter and the Wolf.” You can even print out materials that will get light use on glossy photo paper (or insert pages in binder sleeves), skipping laminating entirely. Of course, I homeschooled pre-Internet, so I typically had to buy cards already printed out and then laminate them. At least there are many more options now! You don’t need to re-create the wheel. Don’t try to homeschool without some sort of plan. 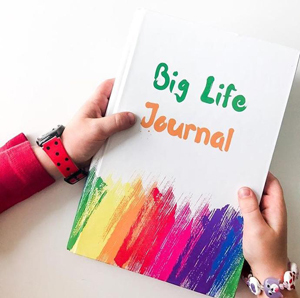 If you’re homeschooling a preschooler, have a set of Montessori albums you use as a checklist. 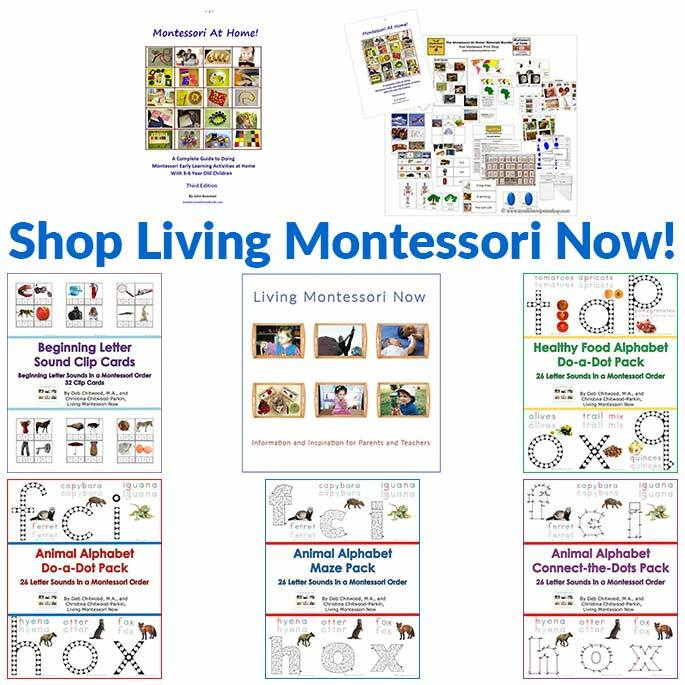 There are free albums online (links are in my “Free Montessori Materials Online” post.) You could copy and paste the table of contents into a grid with columns for presentation, date presented, working on, and mastered. You could even simply print out the table of contents and make notes and checkmarks on it. 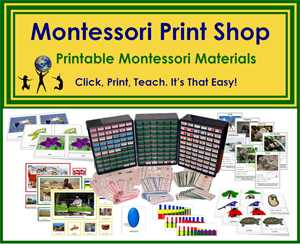 If you’d like to purchase albums for ages 2½-6 (with many activities good for 7-8 year olds), I recommend the Montessori Print Shop Primary Teaching Albums (See my review: “Montessori Print Shop Primary Teaching Manuals.”). The albums are very clear and simple … perfect for staying on track with what’s important in Montessori education. 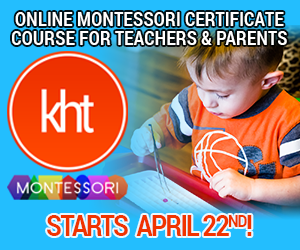 If you’re homeschooling one or more elementary-age children, you might either follow the traditional Montessori curriculum or use Montessori-inspired unit studies. 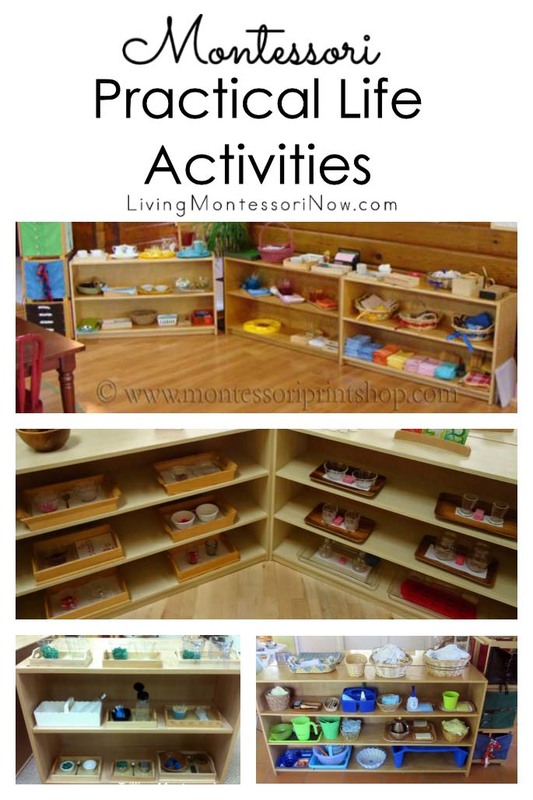 Or you might add some Montessori-inspired materials to a classical curriculum. Since I started elementary homeschooling in 1991, it wasn’t feasible to use a traditional Montessori elementary curriculum at home. 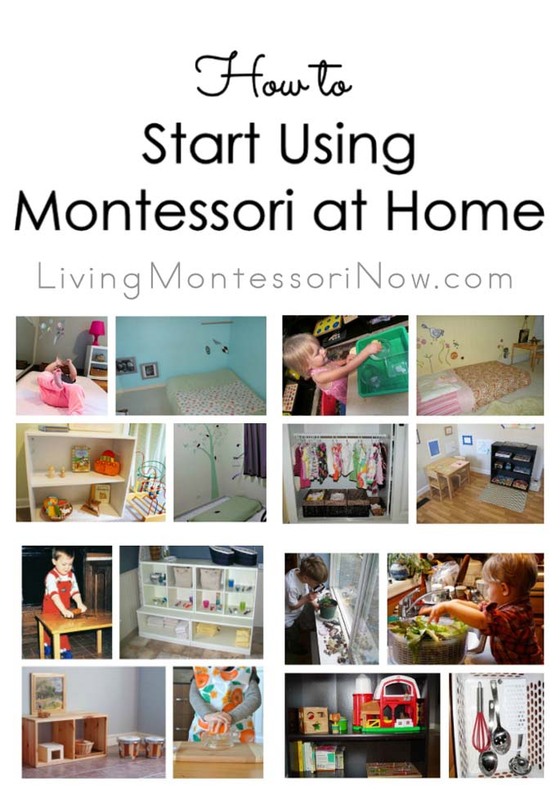 I used Montessori-inspired unit studies, which worked well for my children and me. That still works well for many families. You can use Great Lessons for unit studies, too. 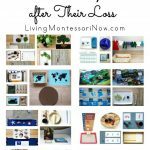 You’ll find lots of ideas in my Montessori elementary posts that are linked to on my Montessori Resources page. 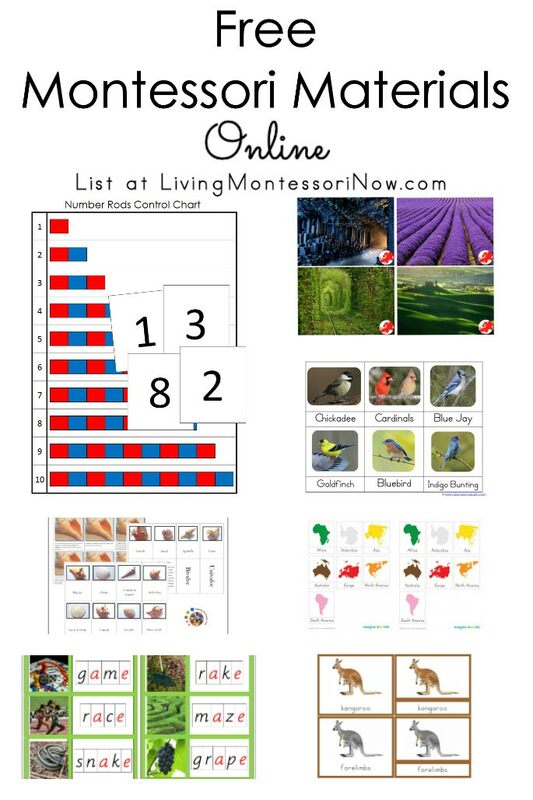 You can always use some sort of checklist like the Scope and Sequence at Homeschool Share (in whatever order you prefer) to be sure you’re covering a good number of areas. 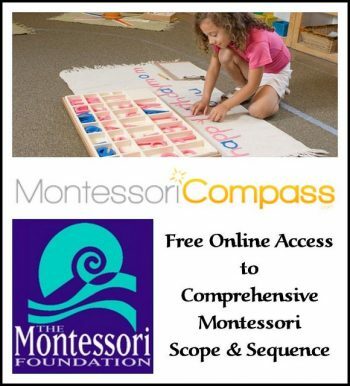 For a Montessori scope and sequence, Montessori Compass and The Montessori Foundation have a comprehensive online scope and sequence through age 12. Or you can loosely follow a curriculum like KONOS (what we used) for basic structure while using Montessori-inspired activities in your unit studies. My post “How to Create a Unit Study” tells more about what we did. 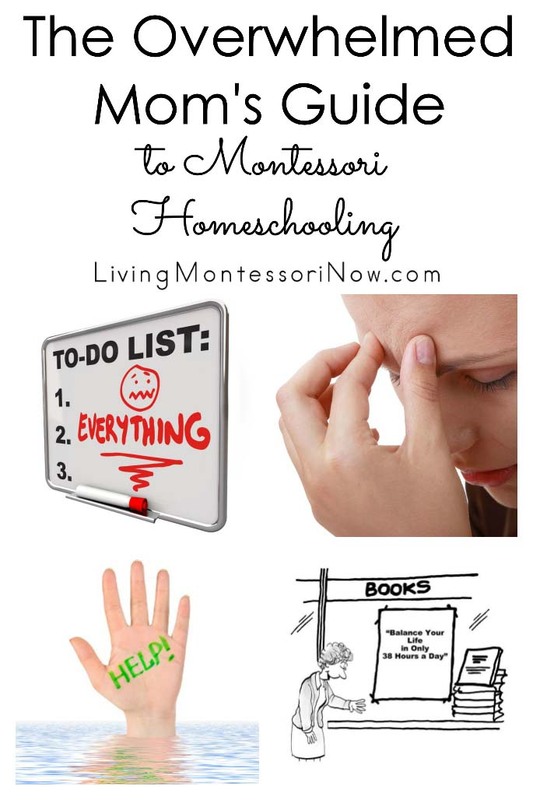 Without taking any training, you can also get lots of help inexpensively from Lisa Nolan of Lisa Nolan’s Confessions of Montessori Mom Blog. 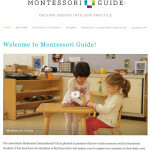 Lisa Nolan is a 3-6 and 6-9 trained Montessori teacher with over 20 years of experience as a Montessori educator. 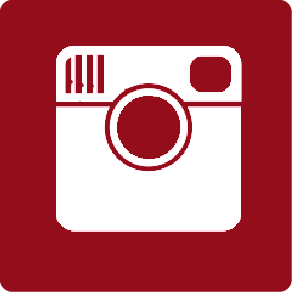 Lisa offers affordable detailed online lesson plans and albums. 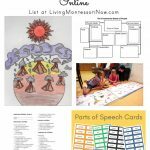 You can find out more about Lisa’s homeschool monthly program for ages 6-9 at Montessori for the Earth (affiliate link). Whether or not you take an elementary training course or use an online program, you’ll probably find it helpful to use workplans at the elementary level. 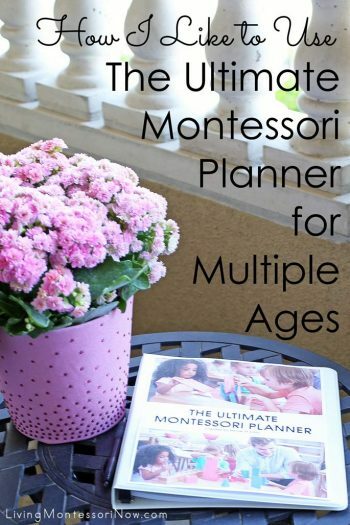 Update: Here’s my favorite planning system right now: How I Like to Use the Ultimate Montessori Planner for Multiple Ages. You don’t need to follow what works for others online. You really just need to follow your own child. That’s what Montessori is about anyway. Observe your child to see what he or she needs and is interested in. It’s literally impossible to do everything you find online. You’ll find many more activities at Living Montessori Now than you could ever do, too. I definitely don’t expect you to try to do all the activities I share. 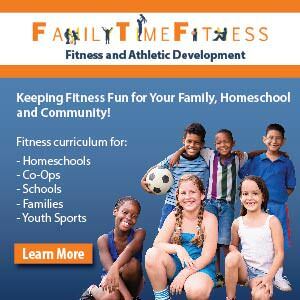 I offer a lot because I know that different activities appeal to different parents, teachers, and children. 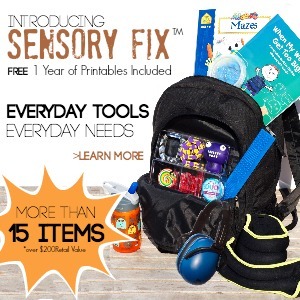 As a homeschooler, you have the luxury and privilege of following your unique child’s needs. If you’re doing a unit study, just pick the activities that you’re drawn to or that you feel your child will be drawn to. That’s what I did when I homeschooled my own children. If something looks too difficult or overwhelming for you to attempt, choose something else. You don’t need to forget about yourself. Maria Montessori emphasized the inner preparation of the teacher. 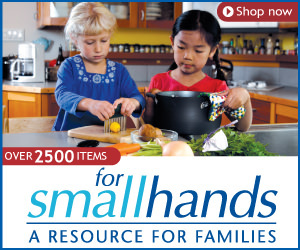 For you as a parent, it’s important to try to find something that helps center you. 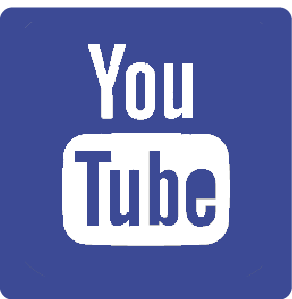 I have a post with some ideas here: Take a 30-Minute or 5-Minute Me Break. YOU DON’T NEED TO BE PERFECT!!! This is always my main advice to homeschoolers. As difficult as it can be, it’s important to realize that you don’t need to be perfect. I started every year with a plan of unit studies for the year. My weekly plans didn’t go as well. They typically became more sketchy as the year went on. Sometimes your imperfection can actually be helpful. I think my kids became more self-directed because I didn’t have everything overly planned. They kept their love of learning and went on to thoroughly enjoy their university experiences. They were able to be very self-directed in their university studies and even got straight A’s. If they didn’t learn something in our homeschool, they knew how to find the answers on their own. So don’t worry. You have many years to cover things. 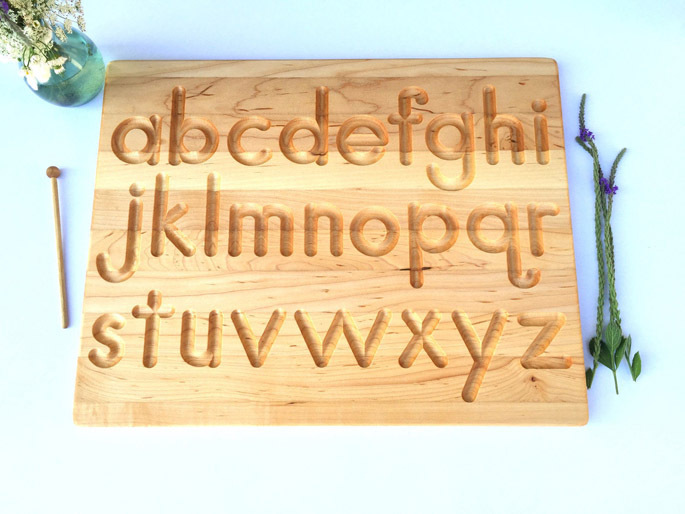 If you’re doing Montessori elementary homeschooling using traditional Montessori curriculum, you have six years to cover the Montessori Great Lessons. If you’re doing Montessori-inspired homeschooling using unit studies, you’ll typically do unit studies more than once. There isn’t such a need to rush. You don’t need to be perfect. 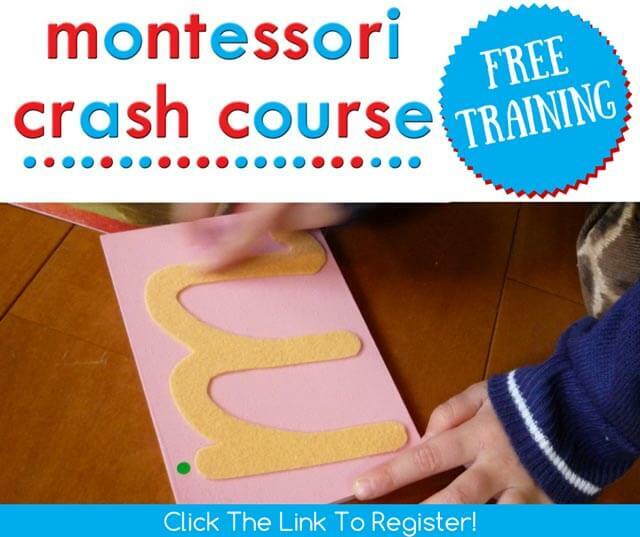 Note: If you’re new to Montessori education and would like extra hand holding, be sure to check out the Montessori Crash Course Jo Ebisujima and I lead. 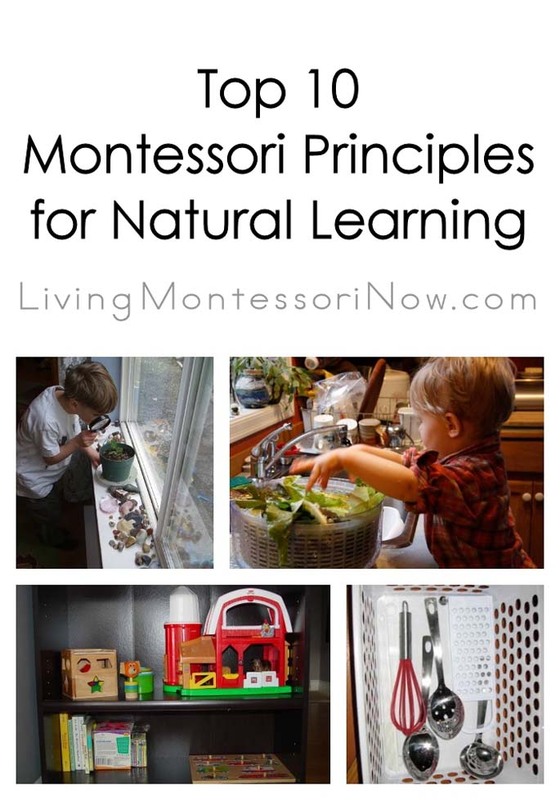 Montessori isn’t meant to be stressful – it’s meant to be a way of life. A way of thinking and a way of approaching learning. Perfection is not required! Thank you so much for this Deb, I needed it! 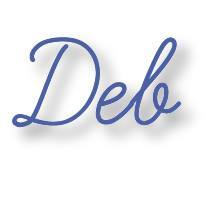 Thank you for your words, Deb! I am really interested in doing this, but I’m worried that homeschooling can affect my child when it comes to socializing with others. Do you have any advice on how I can work this out? Thanks for this post, Deb! Thank you. 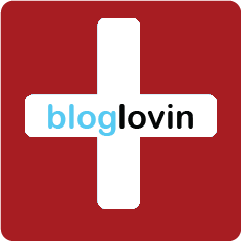 I sometimes find the blogosphere/pintrest world overwhelming, though generally amazingly inspiring also. Thank you for the words of encouragement and the big picture perspective. Thanks so much for this. It couldn’t have come at a better time! Such a wonderfully written post Deb. One of the beauties of homeschooling is the flexibility it offers. Some of our units are more in depth than others depending on the time I have to prepare. Why did you choose KONOS? 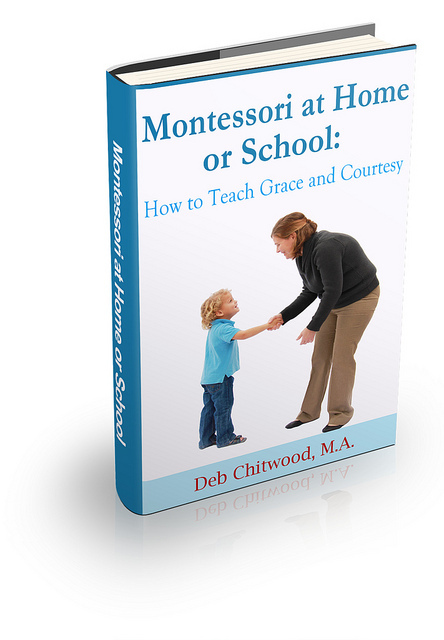 Are you familiar with NAMC montessori homeschool curriculum? Thoughts? In teaching your child, the most important lesson is to NOT OVERDO it and not try to be PERFECT. 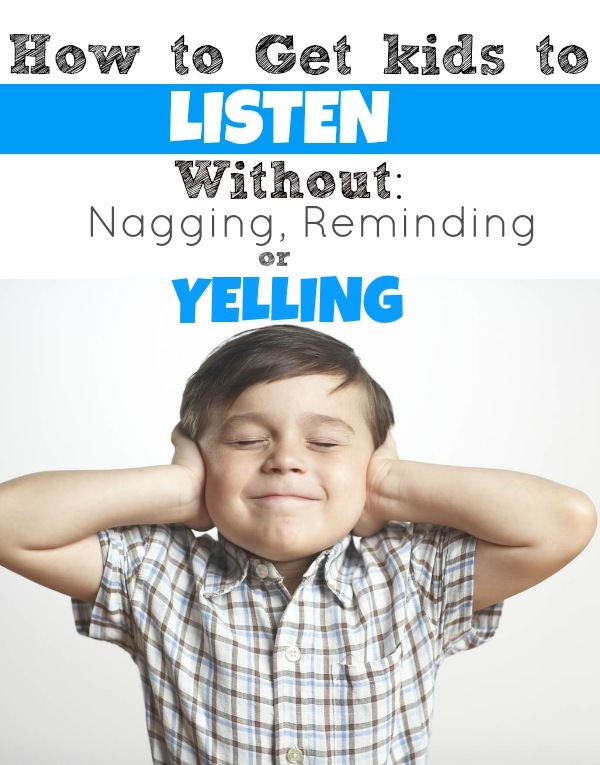 It creates unnecessary pressure on yourself and your child. I’d like to point out a thought in regards to using a table of contents as a checklist – good solid albums have multiple activities, extensions, games, etc within one album page, which are missed by so many people, especially in regards to the sensorial material at primary and just about everything in elementary 😉 My primary album table of contents is so mis-leading, because “pink tower” is listed once, but has 11 “extras” to it – several of which could also have variations, or could be revisited more than once. Thanks even though I’m not homeschooling. I’m still doing extra school for all my girls and even I get burned out. Thanks for the reminder about not being perfect! This is wonderful. 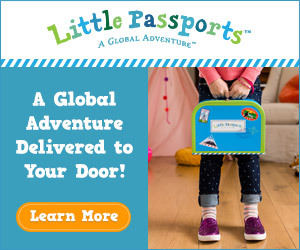 I am new to staying at home, and we are doing preschool at home. I am strongly considering homeschooling long-term, and I know this post will be one that I look back on for great reminders and encouragement over the years. I have homeschooled for two years. This is my third year, but my first year schooling more than one child (7 and almost 3). I am expecting our third, and so overwhelmed I don’t even know where to start. 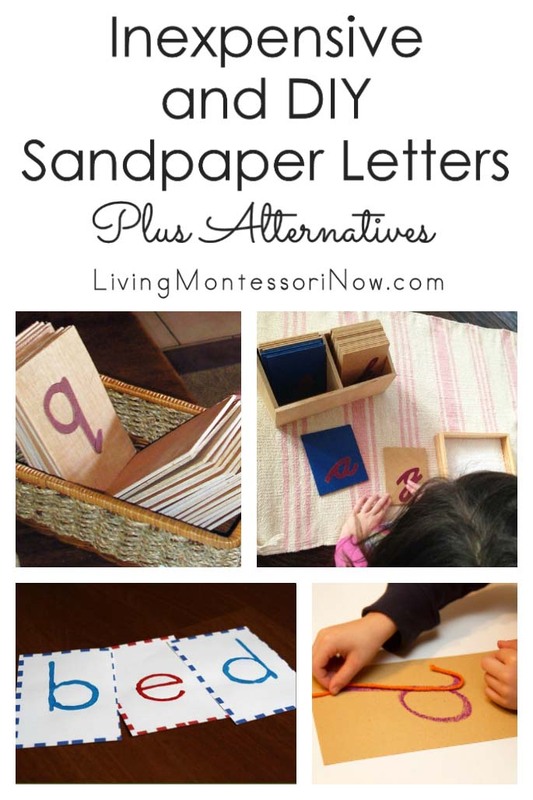 I have done Montessori practical life (pouring, folding, flower cutting/vases, more like Catechesis of the Good Shepherd), and I have sand tray, sandpaper letters, metal insets, golden bead material, colored bead stairs, and am ordering more things for end of age 5 and beginning of ages 6-9 Maths materials. 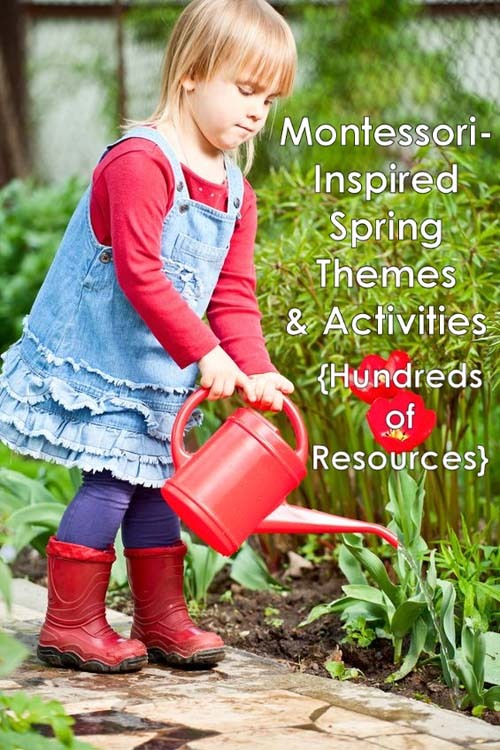 There are so many articles, Montessori manuals, blogs, free printables, unit studies, etc., that my head is spinning just trying to sift through it all. I feel like I’m failing before I begin. Anyone who has any skills with organization, how did you figure it all out? 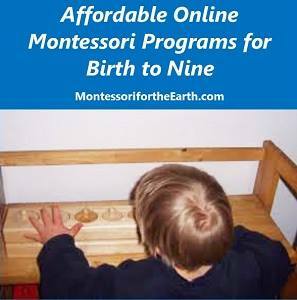 Is there a special MOntessori planner out there? Is there a one-stop book or site that ties everything together simply? Thank you in advance for any advice or help you can offer!